Alongside Francis Ford Coppola’s Apocalypse Now, Oliver Stone’s Platoon is the best representation I have seen of the devastation caused by the Vietnam War. Of the two films, Platoon’s approach is a bit less poetic, opting for gritty and harrowing realism, quickly turning into a fairly direct indictment of one of history’s most violent and pointless armed conflicts. The film focuses on a group of soldiers who, in most cases, had been stripped of most (if not all) of their humanity by the time we are introduced to them on screen. War in Platoon is nothing to glorify, there are no winners, losers or heroes to be found. In the Vietnam of the film there are only victims and victimizers. There are no attempts at turning war into an entertaining sensory spectacle, nor are there any attempts to glorify violence and brutality in any way. In fact, the image of the American soldier is downright controversial, depicting battle-scarred soldiers that have long forgotten how to distinguish between right and wrong. Though there’s an assortment of different characters (among which is a very young Johnny Depp), there are three that stand out from the rest. The first is Private Chris, played by a young Charlie Sheen who was, at the time, still trying to follow his father’s footsteps as an actor. Chris is a young soldier who volunteered for the war. He occupies almost every scene, first as the naive idealist not mentally built for armed conflict, and then as the courageous battle-worn soldier who struggles to conserve some of his humanity. Chris comes off as a soldier who after having survived it all, might either gain a new appreciation for life, or become one of the many souls that never truly recovered from their horrible experiences in the battlefield. In Vietnam, Chris finds two opposing models to follow as a soldier. One is Sgt. Elias, played by Willem Dafoe. This is a defining performance in the film and in the actor’s career. His is the figure that more closely resembles heroism in Platoon. Elias doesn’t believe in the purpose of the war anymore, yet he fights to stay alive and as an obligation to his superiors. Though he doesn’t shy away from violence, he is still compassionate, unable to find reason in the slaying of innocent people. Contrary to Elias, Chris must also deal with Sgt. Barnes, in a career-best performance by Tom Berenger who deserved every bit of praise during 1986’s awards season. Berenger plays a roughened soldier, one with the steely qualities of a leader but driven to madness by the violence around him. As a testament to his emotional scars, Barnes also displays an actual scar across his face which seems to come to life and take hold of the soldier’s wounded soul. 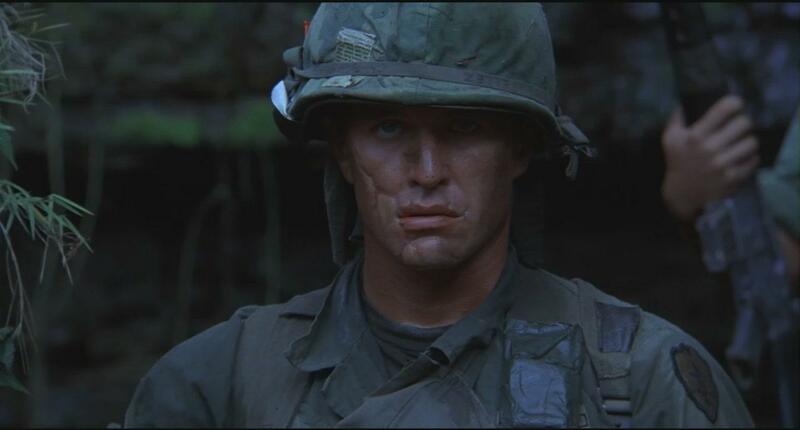 Barnes is perhaps Platoon’s ultimate tragedy, showing us a man who has lost every bit of compassion and humanity, not because he was evil to begin with, but because the war turned him into the worst he could be. There is, in fact, a sense of recognition and acceptance within Sgt. Barnes. He knows that what he does is wrong, yet he finds ways to justify his actions no matter how terrible they might be. Despite being a bit too biased in its devastating anti-war depiction of the Vietnam conflict, the film does manage to place us inside the jungles of Cambodia and Vietnam as if we were part of the platoon. The lushness of the landscape is equally beautiful and dangerous for everyone involved. The heaviness, the heat and the rain of the jungle bearing down on the soldiers and on us as the audience in almost equal measure. There is also a collection of truly amazing sequences in the film. From the forceful taking and destruction of a native Vietnamese town, to the chasing of one of the protagonists through the jungle, and the spectacle of explosive violence towards the end of the film; Platoon is filled with memorable moments and characters that make it an unforgettable cinematic experience. Great review, Niels. I still think this is Oliver Stone’s best film, and it’s neck-and-neck with Apocalypse Now as far as Vietnam movies go. A worthy Best Picture winner. Nice review. I remember watching this movie as a kid in the 80s. My father was one of those Vietnam vets who never recovered. Subsequent PTSD and drug addiction eventually killed him. I’m going to order the movie from Amazon.com and watch it from a different perspective now. Thanks. It’s certainly something else to experience a film you can relate so closely to. The Vietman War was a great tragedy. 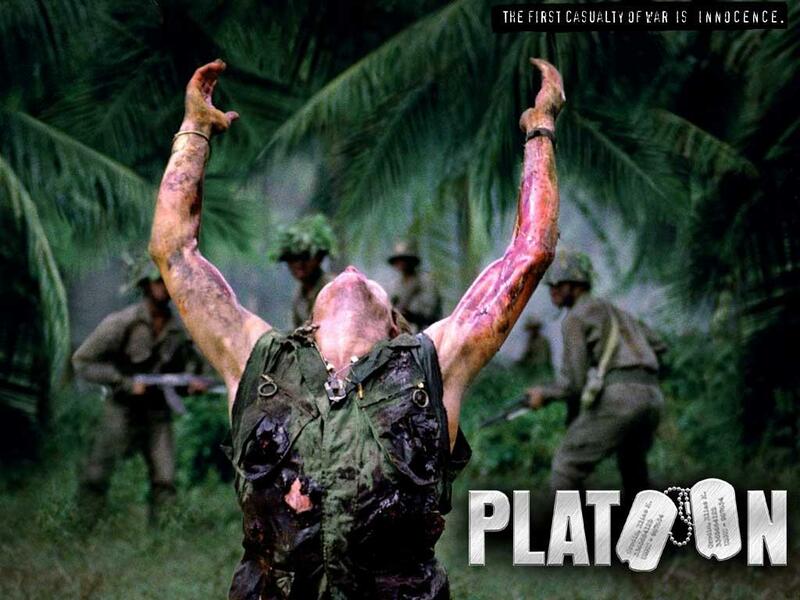 Im sure you will find a lot to take from Platoon the second time around after so many years have passed. Hope you don’t have a hard time watching it. I know I do when I watch anything that reminds me of my father who also passed away much too young.